What a gorgeous setting! 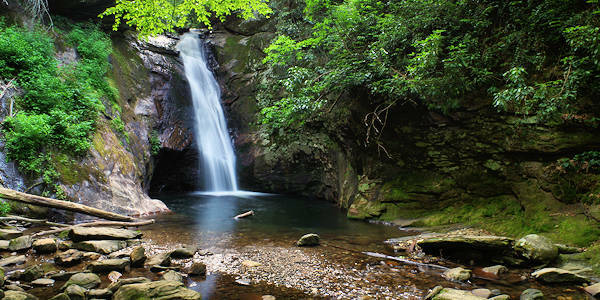 Courthouse Falls descends into a lush, picturesque cove in the Pisgah National Forest. The waterfall plunges about 45 ft. from a narrow chute into a deep pool, perfect for a dip on a hot summer's day. It's an easy hike (about 7/10-mile round-trip) from the forest service road. 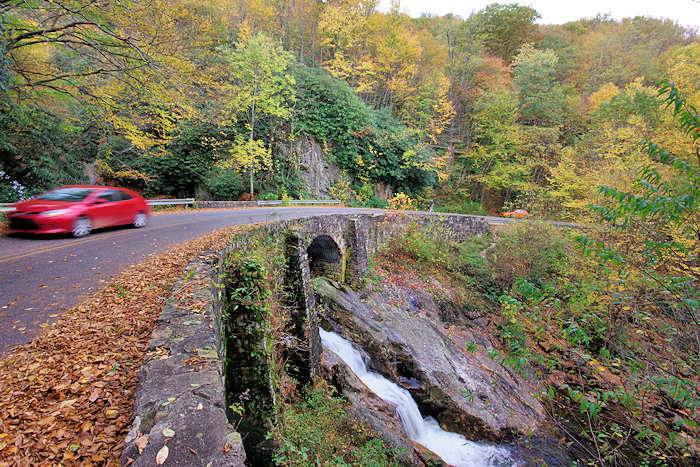 It's located 6.7 miles south of the Blue Ridge Parkway. 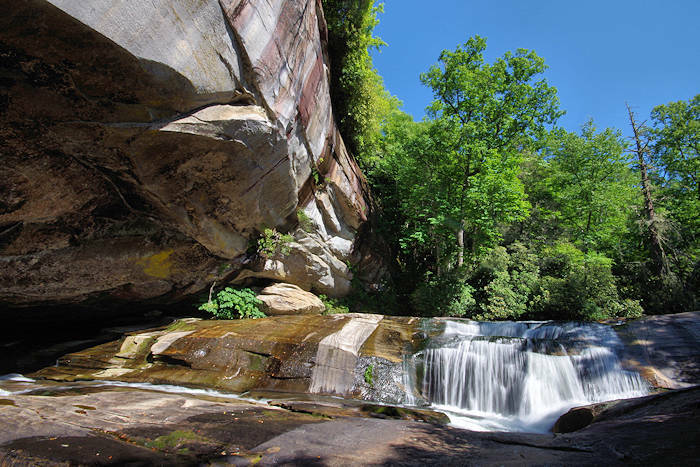 Located off NC Highway 215 (Forest Heritage Scenic Byway), the trailhead to Courthouse Falls hike is three miles up a gravel, one-lane forest service road (FR140). There are some bumpy spots, so the drive is not recommended for low cars. But, you don't need four wheel drive. This road is often closed during winter months into early spring. Just after a bridge at three miles, you'll see a pull-off for parking. On the left near the bridge is the start of the Summey Cove Trail. The trail follows the cascading Courthouse Creek and has some wet and muddy areas, and wooden bridge/steps could be a little slippery. After about 1/4-mile, you will hear the falls and begin seeing them below you on the left. Don't take one of the "cut-through" trails that are very steep. If you keep walking, a side trail takes a sharp left that takes you safely to the base of the waterfall (look for the multiple red blazes on the trees). The mist from the falls keeps this area cool, even in the middle of the summer, which makes it a delightful retreat on a hot day. The waterfall is on the "back side" of Devil's Courthouse on the Blue Ridge Parkway. 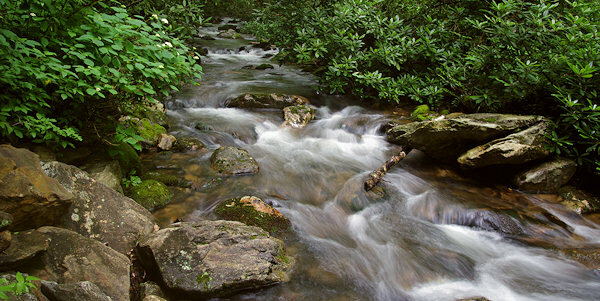 For a longer hike or to access the waterfall when the Forest Service road is closed, hike from the trailhead at NC Highway 215. From US 64, drive 11 miles to a pullout on the left with the trailhead on the right (about a 1/2-mile north of Forest Service Road 140). The Summey Cove Trail is about 2.7 miles one-way, with some steep sections and total elevation gain of around 1,300 feet. 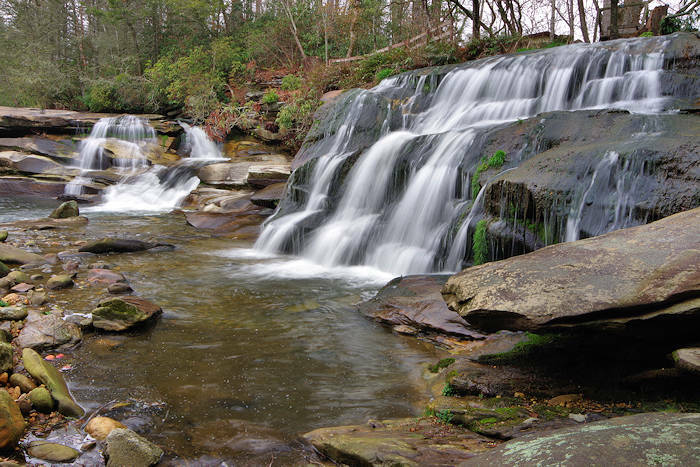 Only a few miles south on NC 215 are three waterfalls, French Broad, Mill Shoals and Cathedral Falls. 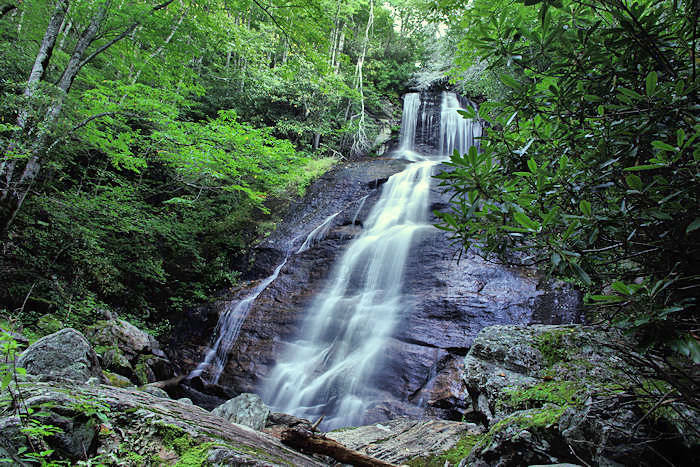 North on NC 215 are Dill Falls, Wildcat Falls and Sunburst Falls. 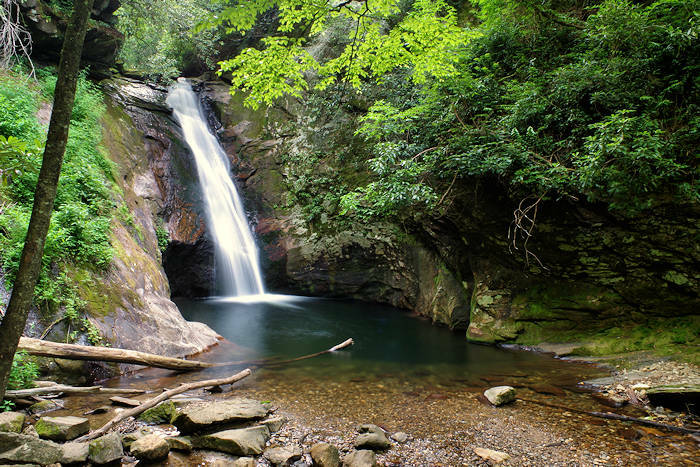 Nearby on the Parkway are the waterfalls at Graveyard Fields and Skinny Dip Falls.